The word “influence” could be understood to refer to a causal relationship. If so, saying that “A has influenced B” is problematic for two reasons: First, such causal influence is often impossible to demonstrate, and second, seeing somebody’s views as products of different kinds of influences easily undermines his or her own intellectual efforts and makes him or her look like a mindless billiard ball. Yet, everyone works in the context of preconceived ideas, which cannot be ignored. 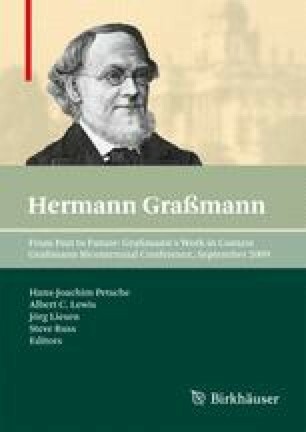 This is most emphatically so, if we are interested in the history of ideas, and in particular, Hermann and Robert Grassmann’s role in it.